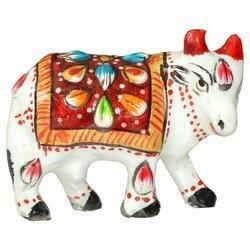 Fine Decorative Meena Cow Statue Available In Different Designs & Sizes. Size: 2" - 24 "
The Antique Metal Mask made by very good quality metal. Fine Meenakari item, made by brass, with panting work. 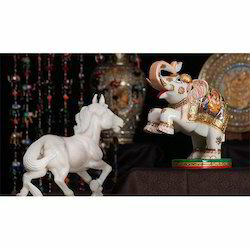 Rectangle Myyra Gem Stone Office Set, Size (Inches): 8" x 8"
रेक्टेंगल मायरा जेम स्टोन ऑफिस सेट, साइज़: 8" x 8"
Dimension (Inches): 8" x 8"
Our organization offers a wide range of Marble Inlay Vard Flooring to our invaluable clients. We manufacture these floorings using A-grade raw material, which is sourced from the trusted vendors of the market. Designed and developed as per the international standards of quality, these floorings are extensively used in homes, villas, lobbies, offices, hotels andexclusive floors. Our organization is counted among the leading names engaged in offering a vast collection of Revolving Trays. This range is beautifully crafted by our designers and serves the purpose of fine dining. We offer this range in wide variety of designs and sizes at very reasonable prices. We also customize the range as per client specifications. With an impressive growth record in this highly competitive industry, we are providing a qualitative range of Oval Shaped Plate Chopra.